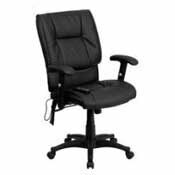 Leather office chairs give your office a professional appearance and the sweet smell of success, wealth and prestige. Nothing quite compares to the rich look of leather. It’s warm in the winter and cool in the summer, easy to maintain and like a fine wine, leather improves with age. Proper care will keep your chair in like-new condition for many years to come. Leather Executive Chairs, Leather Massaging Chairs, Leather Guest Chairs, Leather Ergonomic Task Chairs, Leather 24/7 Intensive Use Chairs, Leather Managerial Chairs, Leather Traditional Chairs, Leather Big & Tall Chairs and Leather Conference Chairs.